As we’re finally dropping iOS 7 in PSPDFKit, I’ve lead the project to migrate everything to Apple’s new wonderful UIPresentationController API. Now UIPresentationController is by far not perfect, but it’s a huge step forward coming from UIPopoverController and makes presenting in mixed environments much simpler and cleaner. 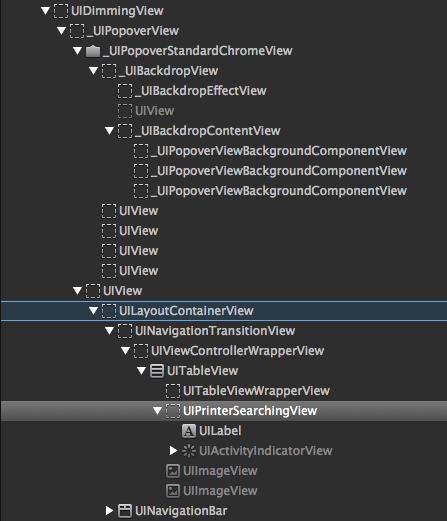 The beauty: The view controller hierarchy is now correct, where in the older popover controller there were unconnected gaps, and it wasn’t easy to go from the contentViewController to the parent presenter. This required inconvenient redirects when a controller inside a popover wanted to dismiss itself. RIP, UIPopoverController. You won’t be missed. // This is more hacky than it should be! // since that one will always be compact if it's an UIPopoverPresentationController. The evil detail is that UIViewController lazily creates a new _UIFullscreenPresentationController, so simply checking for .presentationController is not always correct, as it doesn’t include the case where we are embedded as a child view controller. Now you might think I’m doing it wrong, but there are some valid cases for this. (We have a container that basically embeds other view controllers completely and just adds a switch control as top bar). // Apple can just access the ivar, we'll have to use KVC to get the same. // This is private API - do not ship this! Notice how we change the background so the popover uses transparency, while modally we use a clear white. 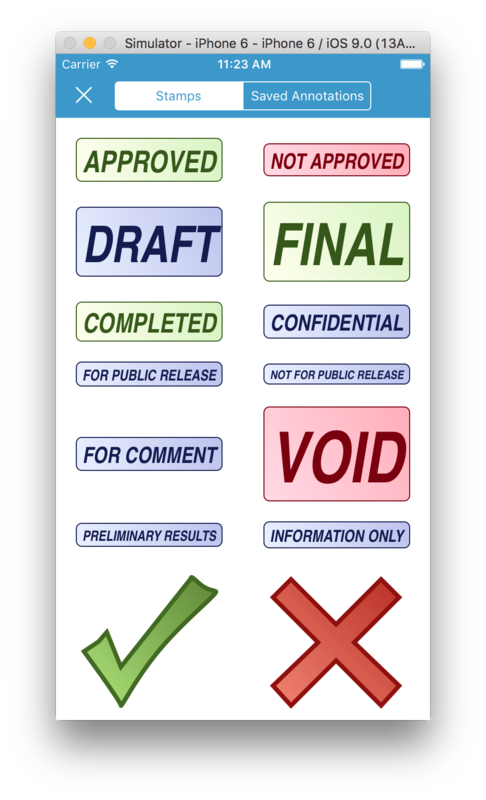 The close button is handled externally by the presentation logic. The solution we use is also not 100% correct - cases where we would present inside the context of a popover would likely be incorrectly flagged as modal presentation - but since we don’t use any of that I didn’t investigate further. Someone from Twitter pointed out that there’s even another way to detect if the UIPopoverPresentationController is really used to present as popover, as we can look at the arrowDirection - if that is set to UIPopoverArrowDirectionUnknown it’s likely modal and not a popover. Are there even better ways? Am I missing something here? I’m not happy with any of the above solutions. Ideally I should be able to ask the controller what his or the nearest ancestor’s adapted current modal presentation is. I’ve filed rdar://22048335 for an API extension - maybe we get this in iOS 10. With Xcode 61, Apple added support for the NS_DESIGNATED_INITIALIZER flag, and also added this to various framework classes. This is likely a byproduct of Swift, where the initializer call order is much more strongly enforced. This goes as far as there’s a new convenience keyword to mark the separation of convenience vs designated initializers. This is a good thing. It’s far too easy to break the initializer chain, even though Apple’s documentation on it is superb. With iOS 8.3, Apple made a modification in UITableViewController that by now, every one using this class will have seen. initWithStyle: is now a designated initializer. And while throughout the beta period, this was the only designated one, the GM suddenly added both initWithNibName:bundle: and initWithCoder: to the list as well - making this class quite inconvenient to subclass. Most of your subclasses will have their own designated initializer since they likely depend on some object at initialization time. If that’s the case, you generally want to prevent users from calling the wrong initializer, even if they are marked designated in the superclass. [PSPDFTableViewController initWithAnnotations:] -> [UITableViewController initWithStyle:] -> [UIViewController initWithNibName:bundle:] -> [NSObject init]. [PSPDFTableViewController initWithAnnotations:] -> [UITableViewController initWithStyle:] -> [UIViewController init] -> [PSPDFTableViewController initWithNibName:bundle:] (which asserts!). This is very unfortunate, and I assume it’s not easy to correct since there surely are apps out there who rely on this call order. We work around this by wrapping our implementation into a clang diagnostic block to ignore “-Wobjc-designated-initializers”, but it doesn’t prevent anyone from creating the controller with an invalid state. Maybe Apple fixes this conditionally in iOS 9. rdar://problem/20549233. What other ways are there do deal with it? Did I miss something here? 1. To be correct, Clang commit r196314 landed in Xcode 5.1, so technically this already had support for designated initializers by using the objc_designated_initializer attribute directly. It’s a language feature in Swift and C++ has a whole variety of cast operators built into the language. I’d love to see actual language support in Objective-C as well. Apple added Dynamic Type in iOS 7 to give the user more control about how large text in apps should be. We’re now less than two months away from iOS 9 yet many apps still ignore this, and almost no app properly reacts to changing this setting at runtime. The system sends a UIContentSizeCategoryDidChangeNotification, however there’s no easy way to re-build the UI with a different font. Apple’s way of solving this is subclassing common view classes like UILabel with their ORKLabel, which fetches the new font and then invalidates its intrinsic content size to trigger a new Auto Layout pass. Similar patters are in ORKAnswerTextField/View, ORKTableViewCell and ORKTextButton. This pattern however makes it hard to set custom font sizes. One could extend these classes to accept a font text style like UIFontTextStyleHeadline to make this more flexible. Apple instead uses subclasses like ORKTapCountLabel to customize the font size. 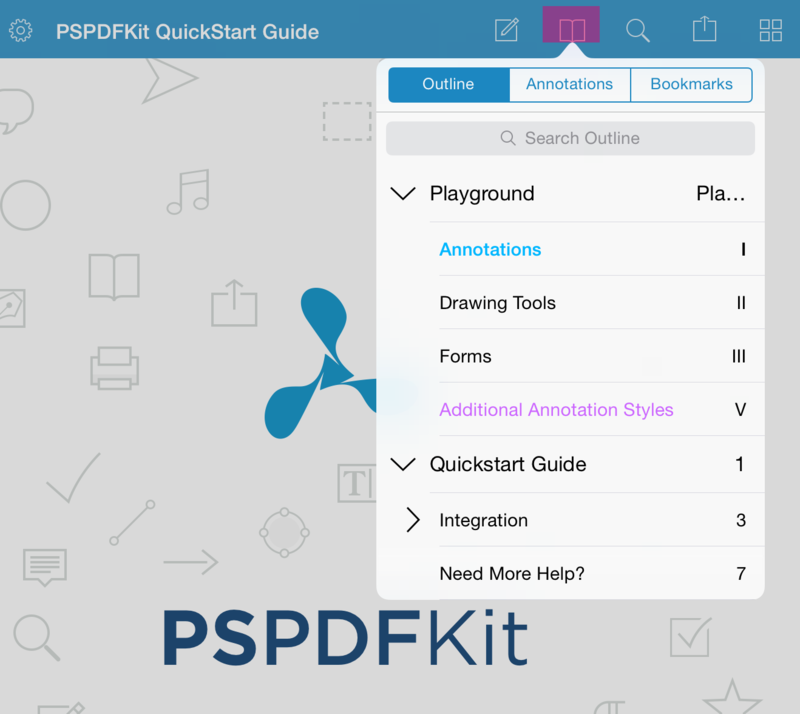 This was particularly interesting, since my main job is working on PSPDFKit - a PDF framework for iOS and Android.. In there we have code that allows converting HTML to PDF via (ab)using UIWebView and the printing subsystem. This is marked as experimental as we were under the impression that it’s not intended usage and more likely works by accident. However Apple’s now using the exact same technique (ORKHTMLPDFWriter) in ResearchKit, so this seems to be an acceptable way of converting HTML documents. It’s really great to see that every class is fully annotated with NS_ASSUME_NONNULL_BEGIN/END. This makes usage much nicer, especially with Swift, but also is great documentation in general. Time to annotate your classes as well! Since we’re at Swift… ResearchKit is 100% Objective-C. And I’m sure this was started when Swift was already post 1.0 so time is not the reason. Then again, the example catalog is completely Swift. Objective-C is a great choice for frameworks as you can decide selectively which methods should be public and which ones private - with Swift, this is currently not yet possible. There’s no clear pattern when Apple uses _Internal and when _Private for private class extensions, however it’s great to see that they do try to keep the API small and only expose the necessary parts. 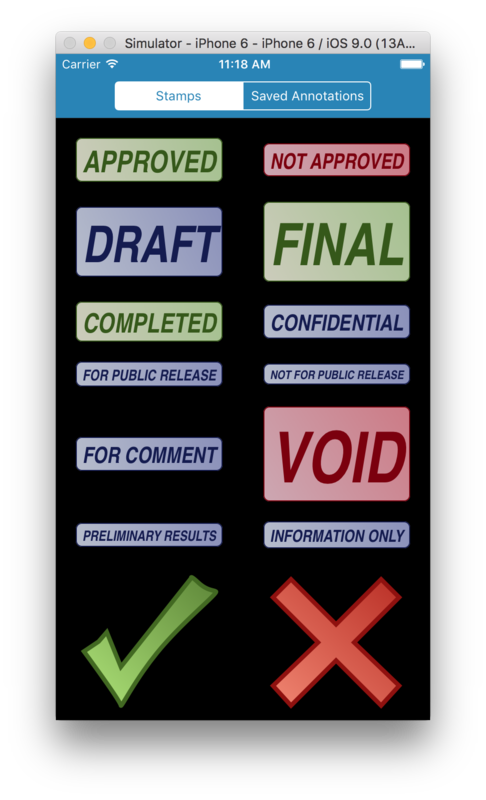 Large text like the consent review language is displayed by view controllers that embed web views. This is all based on UIWebView - so far no WKWebView is being used here. For regular text, that’s perfectly ok and probably even preferred since it’s a lot simpler to use and doesn’t spin up a separate process. On the other hand, Apple consistently uses UIAlertController - there are no references to the legacy UIAlertView/UIActionSheet APIs anymore. It’s great to see Apple adopting secure coding everywhere. They’re using a set of macros to make the code less repetitive but overall there’s nothing special about it. Yes, there are unit tests. They don’t use a Host Application, so they’re all purely model-tests. I’d love to see view/integration tests as well, but it’s a start. If you’re wondering how Apple pulled of these nifty animations and were expecting some advanced path animation code, I have to disappoint - it’s just a set of videos. However, there’s a lot more to it. They are coordinated by ORKVisualConsentTransitionAnimator which is powered by ORKEAGLMoviePlayerView - complete with custom shaders. This is a lot of code to tint a video on the fly! Overall, ResearchKit is very well done. You could critizise some naming inconsistencies, indentation or spacing, but the overall structure is good, and I’m very excited how much better it’ll get once Apple starts merging the onslaught of Pull Requests.. Writing a framework is certainly a challenge - many shortcuts one can do with writing Apps don’t apply. Follow me on Twitter for even more updates. Oh, and if you would love to work on frameworks full-time, we’re hiring. I’ve had a lot of fun today hunting down a particular regression in iOS 8 that caused rotation when the interface was configured to not autorotate. This is particular fun since this was reported by a PSPDFKit customer and since they’re paying for our product, they also expect a solution. So giving them a “It’s an UIKit regression” answer isn’t good enough. Prepared with IDA and decompiled versions of UIKit iOS 7.1 (where everything works) and UIKit iOS 8.1 (where things are broken) I’ve spend the better part of a day diffing and understanding the root cause. Here’s my gist with (slightly unordered) thoughts as I went deeper and deeper into the rabbit hole. If you’re curious about UIKit, you’ll find this very interesting to read. This solution “hides” the rootViewController to basically disable any automatic rotation while the window is hidden, which perfectly solves our issue. I have to admit that I quite enjoy digging through closed source code and trying to understand the pieces bit by bit. Want to work with me? We’re looking for smart developers over at PSPDFKit. Ping me if you’re interested! A while ago, I’ve stumbled on a string called UIPopoverControllerPaintsTargetRect in some UIKit disassembly - definitely worth investigating! Now that I finally own IDA, I did some research. Turns out there’s a hidden preferences file under /Library/Preferences/com.apple.UIKit that UIKit queries for these settings. Digging deeper, I found a bunch of very interesting and useful flags for debugging, which print extensive logging for touches, gestures, animations and more. I’ve listed the most interesting flags in the gist at the end of this article. The process was easy for UIPopoverControllerPaintsTargetRect but quite a bit harder for most other flags, as these are protected by a check to CPIsInternalDevice() which lives in the private AppSupport.framework. All it does is query libMobileGestalt for a few settings; checking if "InternalBuild" is true or if alternatively "Oji6HRoPi7rH7HPdWVakuw" is set to YES. I’ve tried to use dlsym to get MGSetAnswer() and set the values manually, however this doesn’t work - it seems that only a few values are modifiable here. So instead, I’ve used Facebook’s fishhook to redirect all calls from MGGetBoolAnswer and manually return YES if it’s queried for “InternalBuild”. Granted, we could also hook CPIsInternalDevice instead; both will work. Want to try for yourself? Check out my UIKitDebugging repository and add all files to your repository. Remember, that’s just for debugging and to satisfy your curiosity, don’t ship any of that. Here’s some interesting output. The touch and gesture logging seems very useful. Daniel Eggert asked me on Twitter what’s the best way to retrofit the new containsString: method on NSString for iOS 7. Apple quietly added this method to Foundation in iOS 8 - it’s a small but great addition and reduces common code ala [path rangeOfString:@"User"].location != NSNotFound to the more convenient and readable [path containsString:@"User"]. Of course you could always add that via a category, and in this case everything would probably work as expected, but we really want a minimal invasive solution that only patches the runtime on iOS 7 (or below) and doesn’t do anything on iOS 8 or any future version where this is implemented. This code is designed in a way where it won’t even be compiled if you raise the minimum deployment target to iOS 8. Using __attribute__((constructor)) is generally considered bad, but here it’s a minimal invasive addition for a legacy OS and we also want this to be called very early, so it’s the right choice. I’ve recently spent a few days extracting and polishing the AOP code from PSPDFKit, and the result of this is called Aspects - a delightful, simple library for aspect oriented programming. Now Aspects is a great new tool in your toolkit. It allows to call code before, instead or after the original implementation, and there’s no need to manually call super, cast objc_msgSend or any of that other stuff you have to should do on swizzling. Use it with reason, it has a few great use cases, some are well-explaind on the GitHub page. Right, Apple fixed that in iOS 7. But I was more curious how this is actually implemented. It’s actually quite tricky to detect if you are inside a popover or not, and sometimes this quite important to know. Has Apple some “secret sauce” they’re using here? I opened Hopper to find out. That’s roughly their code, converted back from assembly. Interesting that there’s a _UIImagePickerControllerAllowAnySuperview to disable this check. You have to wonder where they are using that… The check is otherwise quote straightforward. The interesting part is here: [_UIPopoverView popoverViewContainingView:self.view]. Ha. There’s no secret sauce here. Apple is simply iterating the view hierarchy to find the _UIPopoverView. Fair enough, it’s a simple solution. Sadly there’s no _UIPopoverView for us mere mortals, it’s a private class. That’s all - this makes the controller work perfectly where it threw an exception before. The popover restriction was a pure could be a political one, or there are edge cases we don’t know. Now, we want to implant our own check using Aspects. PLLibraryView is again private, so we’ll use a runtime class lookup to hook it globally. I also commented out the property check since this would disable our own checking code. UITextView on iOS 7 is a lot more powerful, since Apple switched over from using WebKit to TextKit for rendering. It’s also very much a 1.0, and has some rather terrible bugs. In fact, they go so far that people started writing replacements for the whole scrolling logic. Of course, people reported these issues in PSPDFKit as well, so I had to find a workaround. I’m using contentInset when the keyboard (iPhone) or another view (iPhone/iPad) goes up, which is pretty much completely ignored by UITextView in iOS 7. This is frustrating mainly because it works perfectly in iOS 6. At first, my solution was based on a category, but after discovering more and more needed hooks, I moved over to a subclass that automatically forwards all delegate methods. This has the advantage of more shared code, and we might be able to remove all those horrible hacks once iOS 8 comes out. I certainly hope so, and will write a few more radars. When adding a new line, UITextView will now properly scroll down. Previously, you needed to add at least one character for this to happen. I have to give credit to countless people who searched for the same solution – this very much was a community-oriented fix. Sadly, this doesn’t seem to be a priority for Apple, since it’s still broken in iOS 7.1b3. Please fork the repo and send a pull request if you have any ideas on how to simplify the code or find an even better workaround. It’s one of those days where Apple’s sloppiness on iOS 7 is driving me nuts. Don’t get me wrong; I have a lot of respect in pulling off something as big as iOS 7 in such a short amount of time. It’s just that I see what’s coming in iOS 7.1 and so many annoyances of iOS 7 still aren’t fixed. No, I’m not talking about the offset arrow, the background – I already made peace with that. But the offset label just looks like crap. (rdar://15748568) And since it’s still there in iOS 7.1b2, let’s fix that. Done! Now obviously this is a bit risky – things could look weird if Apple greatly changes this class in iOS 8, so we should test the betas and keep an eye on this. But the code’s written defensively enough that it should not crash. I’m using some internal helpers from PSPDFKit that should be obvious to rewrite – comment on the gist if you need more info. Best thing: The code just won’t change anything if Apple ever decides to properly fix this.